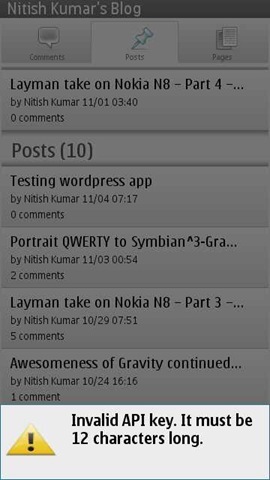 Finally the day has arrived and with arrival of official WordPress App, a long long wait ended for Symbian^3. 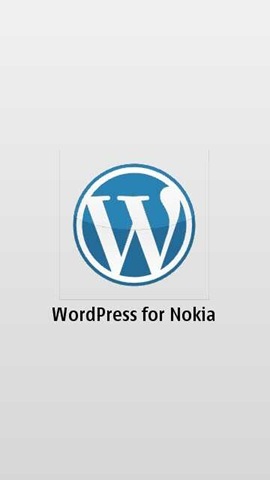 Over those days, when after looking at names of Blackberry and iPhone on the home page of WordPress, you were feeling like hitting someone. 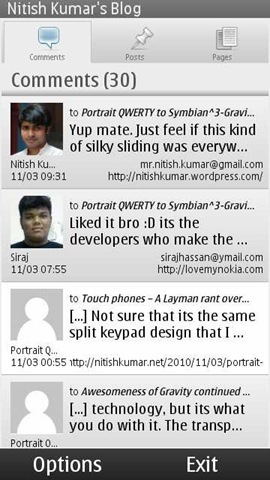 You must thank people at http://dev.nokia.wordpress.org/ for bringing this on and with this, one more point of my Nokia N900 vs Nokia N8 debate goes down. 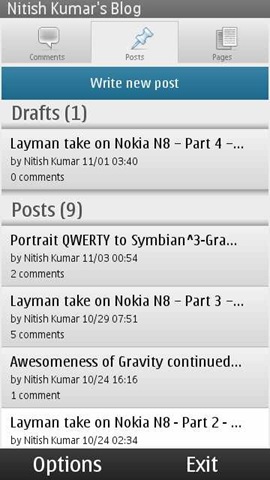 Now, not only we will be able to watch our movie collection on Nokia N8 without converting it, but also will be able to blog on the go like I did with MaStory on Nokia N900. Lets know more on it. 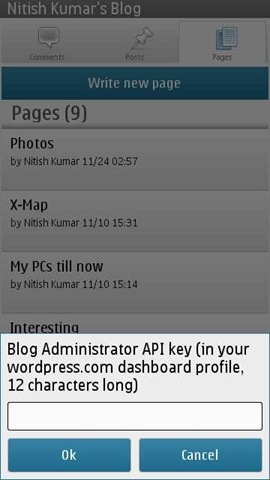 Definitely when comes to look and functionality, this wordpress app is leaps ahead of the one I seen on Maemo and sure many will prefer it over MaStory, when very soon it will arrive on Maemo as well. Just finish a few small details and you are ready for dealing with all the basics related to your wordpress.com or wordpress hosted blog. You can not only add new posts, pages or comments, but you can view even stats of your blog by some very easy and sleek looking interfaces. If you want to reply some comment, then you can go from touch and hold on the comment and it will open up another page for posting the comment with some normal rich options like bold, italic, quote or link etc. Though I do not find posting picture option here, but that also doesn’t exists in desktop version as well easily. 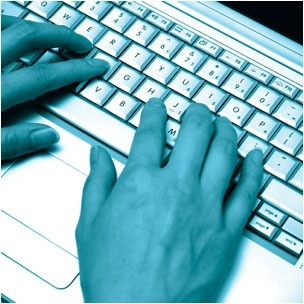 Starting a new post is also simple and with all the options like password protected, draft etc. It hold all the options like adding tags, categories, photos and even videos. There is an option of adding location to the post, but I think its not implemented well till now as I was not able to add it by detecting automatically. May be some fault from my handset side. 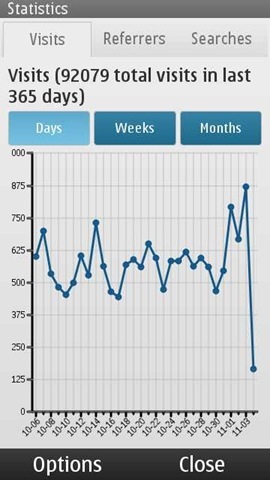 Stats are something that each of the blogger get obsessed about in early days like mine and so its really wonderful to have them always with you on the go. I must say that the Qt based interface has everything that one needs to get impressed with it and quite handy, if they keep connection and minimal data requirement in mind. Well I must say, I am also not happy about the ways it functions odd times. There are still many bugs that shouldn’t have been here in the real world, when an app officially hits the stores. I understand the eagerness of people to get it as soon as possible, but its part of the job from developer side to test it fully. I am wrong then someone please correct me, but I have not got it opened yet on WAP connection. May be the reason is, it tries to load last 10 posts in the system. I don’t think that is a good idea. More than a blog managing tool, it also must have been prepared as a blog posting and casual editing tool. That would have made more sense. Definitely for opening only, it must not go to web directly. Update: It looks like this was the first time glitch, but still even if I am able to view the old cached content now. I am not yet been able to add/ edit. It seems to have removed my account completely though cached entries are still here. 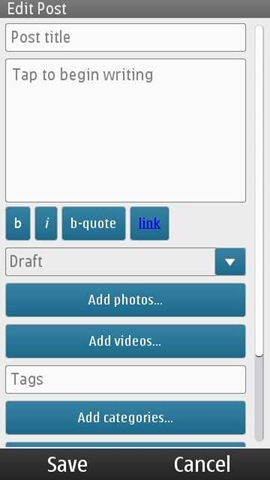 When you are talking about an app to post blog etc, then Draft feature becomes a must, specially much more big must, when you are talking about a mobile app. Update: There is no settings for in it for the same at least. Checked that. MaStory has it and they should have taken some good things from there. As of now, the ovi store version doesn’t seem to forgive you, if you made some mistake at some point of time. I found the latest on the development blog a little better in this way. But see what happened with the official Ovi Store version. My only mistake was to put the wrong API key and it just freezes right there without giving any other option than going to task manager and kill it, which doesn’t promises that it will start fine in next. Well!! is it the issue with whole touch UI, when some app go untested thoroughly? That some kind of stupid design. Why the app needed to load the whole post again, when he has to reply just one of the readers comment? I guess the app is being tested in some environment with cool and strong wifi connections only. The world is bigger than that. Open up please. Yes there are basic ones, but nothing like page justification etc. May be I will find out them like I got to see on MaStory on second day only, but as of now. I am not able to. Thanks to connection issues as I am using Vodafone WAP connection only. So, these were a few early annoyances, I found in first shot. May be I will find some more or may be it will be lesser soon. But sure, there is always scope for improvement. Please add up in comments, if anything I might have missed. Your tips are always welcome, lets make this place happening. I have already written over this once, but even that time, I mentioned that “I am not expecting anyone to learn from this article that “How to make A Website out of WordPress” by this website, as my approach was kind of naïve and nursery kid’s learning”, but this topic was something that kept on tempting me and today I am back. In fact, I was to design a website for my workplace for internal requirements, so I thought to revisit the instructions and pen them down for once, so that people wishing to do something like that could get the job done in one shot without much R & D.
Reasons might be plenty.. from a Company to even a Coffee shop now days wanna have a site and their opinions on it. Yes!! blogs are here and they get recognition too, but a site is a little different thing look-wise and even bloggers wish to have their full control over their blogs, which online hosting like WordPress and Blogger couldn’t afford to provide for their right reasons. Reasons are plenty for a WordPress based website. You may want to have a website to show off between your friends on the same LAN in some college like MNNIT, IIT, IIIT or some IIM or you may want to bring a community or even official platform for company insiders. 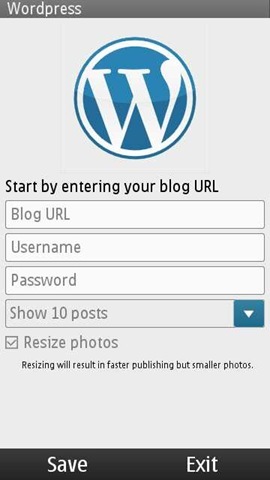 WordPress because, it seems to be the best solution against its competitors for Installation, Management, controls, scaling and even backup/ migration. In just few mins, even a Layman get a strongest of website running and he wonders that he never knew a single line of HTML. “Simplicity is power” That’s why WordPress. Otherwise technically speaking ..
WordPress is an open source CMS, often used as a blog publishing application powered by PHP and MySQL. It has many features including plugin architecture and a templating system (supports various themes that way). Used by over 300 of the 10,000 biggest websites, WordPress is the most popular blog software in use today. My requirements this time .. The purpose was be to build a one-stop website to provide a common platform for sharing information, internal news and more importantly a mean to interact with groups and individuals across the company (via group/ private chat solutions). The additional scope of the website was integrating all of our web modules running for different purposes mostly via web links only (easy way). All of the content needs to be secured via passwords and login would be required for access any of the content on website. Different pages required for different department/ groups, which will host posts from their side only (though all of the content would be subjected to moderation). Different levels and roles would be required to post/ modify the content like Administrator, Editor, Author, Contributor and reader with their controlled set of privileges. Intranet Chat facility requires having group/ private messaging support. Email facility would be limited to contact form that one could use to submit some query to any department and it will be mailed to designate email ID directly without being post on Website. (provided Internet facility available on server). News flash system that will show significant information scrolling on sidebars all the time. Integration with our other services (mostly via hyperlinks opening in tab or new windows) like Ticketing system, Training Modules, Monitoring System etc. The target would be to implement a single-sign-on for the similar web services like Training, Helpdesk etc. There might be possibly different sites for different networks that would be kept in sync5 by end of day or twice a week (based on feasibility). Optional Documents hosting that could allow viewing Doc, XLS and PDF documents online without converting them into HTML This feature could be utilized for hosting various policy documents or similar things. I guess very generic yet professional kind of requirements these are, though one can always find what they want with a WordPress. You know that installation requirements always vary around what you need and what you could put in. In itself, WordPress isn’t a huge software package that you might be thinking about this side, but yes.. what platform you are going to use, matter more. You can make use of XAMP installation to bring Apache, MySQL and PHP at a place on Windows or you may like to use the natural Linux Platform. Here I am going to use WordPress MU (separate project build for multi user environment) in place of normal WordPress though requirements and instructions would be the same. Disk space: Installation doesn’t take even 50 MB, but it’s suggested to keep 1-2 GB space at least. System Software: Apache with Mod_Rewrite, PHP , MySQL and related components. Note: Internet required for easy Installation of packages and plug-ins, though all the packages could be installed and managed offline as well. Edit /etc/httpd/conf/httpd.conf and search for AllowOverride None and replace the second occurrence of the same with AllowOverride All (essential step for Permalink structure, you will know later on). Restart the httpd service by service httpd restart. On Server Console type mysql and then on MySQL prompt type create database wordpress to create a blank database to host WordPress database in next steps. You can chose any other name than wordpress as well. Edit /etc/vsftp/ftpusers and /etc/vsftp/user_list to comment out root entry in both. By default root is not allowed to login into ftp. 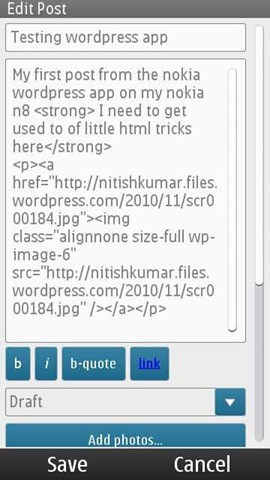 Extract the same and rename the folder wordpress-mu to something suitable to the name you wish to have in url (e.g. We have atstoday in our case). We also could install the same in web root but in that case, it might have issues in other web app installations. Open http://IP_Address/Folder_Name in any browser, where IP_Address is IP Address of the server, you are installing and Folder_Name is name of the folder, you copied into web root. If everything is fine, then it will provide you the installation page and will ask for Database Connection details. First select radio button for Sub-directories in Blog Addresses option, then in next keep Database Name as wordpress as we given the same in step 4, User Name will be root, password would be blank or if any password you given for MySQL user named root, Database Host would be localhost, Server Address would be the IP_Address, Site Title would be the text you want to be displayed on title bar and then it requires to give an email id essential for password recovery. If everything goes fine, then it will show success message and will provide a generated33 password for admin user. Note down the password or copy it. Press the login button, login into the site, go to users in left pane, edit the user and then change the password as per your convenience. The above procedure creates the basic install of WordPress-MU. For customization as per needs, you have to go through themes and various plug-ins available for WordPress. Theme: If online, then we could use the search facility under Appearance->Theme to search, preview and download themes available on WordPress Database. Once downloaded, it will be available in offline install. There is option for uploading themes as well that could be used if Server not connected to Internet. 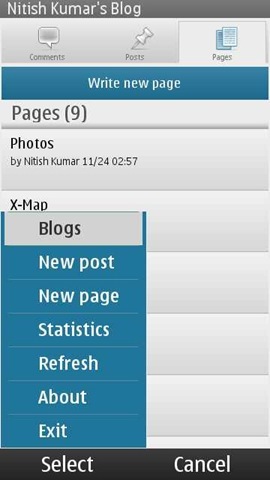 We are using theme named Atahualpa with a few advanced customizations in code here and there. 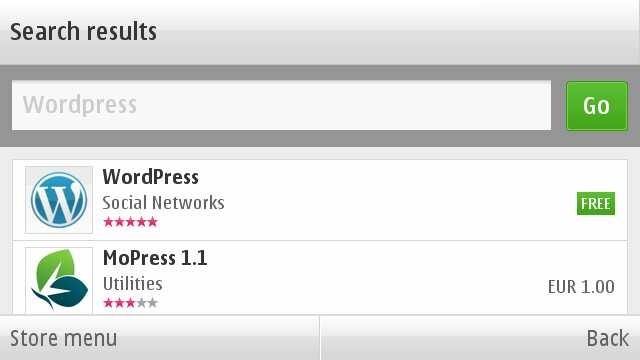 Plug-ins: Plug-ins provides extension of capabilities for basic WordPress Install though depends on many factors. Currently we are using a few crucial plug-in like: My Category Order, Announcement ticker highlighter scroller, WP-UserOnline, Dagon Design Form Mailer, WP Customized Login, Members Only, PHPFreeChat, WordPress Database Backup and User Access Manager. Post/ Categories/ Tags/ Comments Backup/ Restore: For taking backup of these contents, there is option to export all these in form of .xml file, in Tools->Export. Similar way, Tools->Import could be used for importing the same. Settings Backup/ Restore: Inclusion of WordPress Database Backup plugin makes the job little easy. As per settings, it could keep on mailing core database files in zipped format (*.bz2) to designated email ID (provided the server is on Internet) or there are options for taking manual backups by pressing button. For restoring from backup, you need to unzip the backup file first that would be some blog.bak.sql and then needed to restore it via command line in following manner. You have a completely configured and working WordPress based website at one server. You got another server with fresh installation. First of all, you need to perform the first six steps of basic installation as those are preparing steps. Now, you will have a blank database named wordpress ready in MySQL. First use core backup file from original server and use the steps mentioned in Settings Backup/ Restore to place the same database (including settings/ post/ username/ passwords everything) in new server. In next, copy all the wordpress files that would be in /var/www/html/Folder_Name, in the similar location at new server. After the same, you need to edit a few options in /var/www/html/Folder_Name/wp-config.php as per the new environment. Then, you need to manually update the new IP Address inside many tables of new database, provided you always used absolute links in your website all the time. Here is a list of few crucial tables and values to edit. So, this is whole thing.. any further question.. you can always come up here and ask. I really miss that while studying, I wasn’t aware of this great thing, neither do I was in my starting job days.. hope many of you starting earlier than me.. good luck..
Whats wrong with Social Services of Google? It disappoints you when you get to see nice innovations not catching up that faster than they should have. I was under huge disappointment, when come to see Google wave not taking off the hood that well and even when its for sure that Google Buzz is here to stay, it annoy you a little that why its not catching up that faster. What wrong with technically the best services of Google in social department? A question that’s been repeatedly asked and attempted to be answered so many times in so many ways still remained confusing. A company, who seems to have best moral grounds and respect among users all around the globe, a way of thinking that always seems to be working for betterment of technology and pushing the standards up, a technical leadership, which always believed in simplicity yet the best practices and at the end, owner of something called close to God Google’s Search, which tends to knowing people’s habits more than anything else in the world. Still the company not rising that big on social fronts? Why? 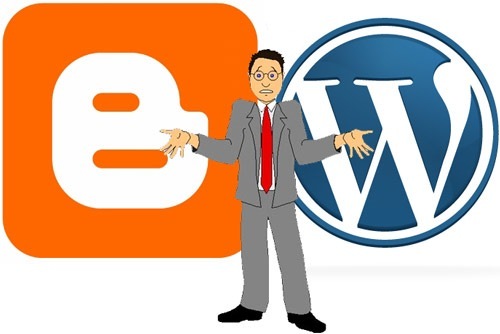 Blogger has much support and options than WordPress, still WordPress rules big time. Orkut been more simpler, cleaner and centered around people more than the business/ advertising, but still it not catching up big time against Facebook or MySpace. Social Connect and FriendFeed been around with nice features, but no one seems to know much about them not even names. Google Buzz was way better than Twitter or Facebook status updates, if we count on specifications sheet, but still it seems to loosing battle against Twitter. Then why so many ‘failures’ whenever Google attempts some social thing? Is the answer lies in their most successful service Google Search itself? What if its Google’s obsession with cloud computing and unification of services, which holds them back from thinking outside the box? Is the reason, is compatibility issues that take time with their 64 acquisitions till now? All of the above may seem to be random and somehow irrelevant with the current discussion na… let me explain each. Why I am pointing over the most sane thing ever happened? Issue is that their programmers and other people involved are kind of devotee for Google like anyone on this planet and sometimes it hinders with ability to think outside or against the main philosophy that may be laid by top management that “Let the consumer use the thing in simplest way, all complications we will handle free of cost” Philosophy is great, Simplicity is great, but the problem is – Everything is not a Google Search. You may not decide what would be the best for users. You have hands on almost each service in the world, but you cant keep on suggesting people to use them at the first place before you mature each of them to stand on their own. I know many would say that Google does allow other services more than any other company in the world, but still I am making my point here ..
One example is WordPress Vs Blogger; Acquisition from Pyra Labs, Blogger seems to be most flexible blogging platform on the planet for people, who are happy with writing and don’t even want to own a domain. you can make use of all kind of scripts, insert any kind of custom code, add other Google services and even write and use your own theme yourself. Then why wordpress still known as the best platform for blogging? 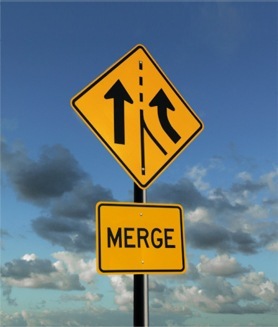 Sometimes initiatives and one product centered approach wins over projects with bigger potential and bigger resources. WordPress has established the whole system with involvement of other companies as well, while Google thinks that we have options in our own domain itself then why go outside? What’s point of not providing support to import whole blog to port on WordPress or others? What’s point in letting users resister their domain names with Google only? What’s point in keeping just a few very basic themes on showcase thinking that users will do everything? Why no inbuilt tool for stats? Why can’t one webmaster change the content of comments to strip out abusive content? Once you start using Blogger, you really find that its best thing to go with, but not in first glance itself. Sometimes, I feels that flexibility should be matched well by offering excellent example/ templates and it should not only be on users and third party developers to evolve over the platform, but one should keep himself running in the race. There are some excellent themes and options with Blogger, but none of them are on showcase, like Google don’t wanna save itself from responsibility after putting other’s work on showcase. This doesn’t suit a beginner. Same with Facebook Vs Orkut; Google’s initial hesitations from advertising inside Orkut due to inputs from overly cluttered interface of Facebook and MySpace cost its being first choice for third party developer doing their work for money. That kept the concept of Social Networking sane, when Zyanga with its games like Farmvilla and Mafia Wars etc attracts 80% of Facebook, then one really come to rethink that if the strategy to keep the place personal only was helping at first place? 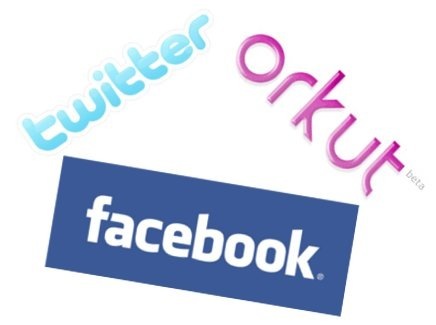 I still love Orkut and still know, the traffic to Orkut is true traffic rather than that of game freaks (the case with Facebook), who will sooner or later get bored with games and then will be frustrated that there is nothing like friend updates in Facebook, but just Farmvilla updates…. but still I wish to ask question that why Google failed to bring more developers in orkut? Simplicity may not be the best policy always. Cloud Computing: Somewhere we don’t see what Google might be seeing for future. 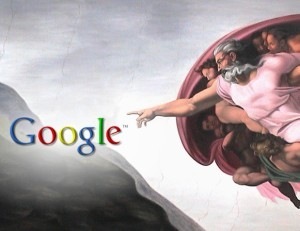 Google’s each move heads towards cloud computing. Similar things were started from Microsoft, who wanted to place best solutions for everything that a user might ask for, but now Google seems to be more aggressive on the same front. Google is heading to the topology of “One Account for all” and their recent XOAuth step seems to be right step in right direction. They already have placed all common services on cloud, be it search, mails, blogging, news, feeds, photos, maps, friends, entertainment or anything one do with computers. Chrome OS meant to be the gate of cloud computing, where one login will make you working from anywhere and from any device. Yes! they had removed the necessity of having a Google Account for their Chrome OS, but still that clears the intentions. What do you think the Google’s obsession for speed, Launch of Google Docs, which enables you to read all common kind of documents online without any installation, advancement of YouTube and its agreement with Media giants to provide full movies or cricket shows like IPL, Google Books, Google translations and flooding like a rage plugins for Google Chrome; is all random? Google seems to have learned that sometimes things that come in packages and work decently win over specialized products, examples been Outlook Express and Internet Explorer. The rise of NetBooks and popularity of Google Docs really have made it possible for Business persons doing their work with minimal and cost effective setup. Being comfortable with such a system is the first step towards Cloud Computing and though Microsoft started this, but Google making it a reality for sure. If we see from Google’s point of view, then it makes sense that you login though one account on Chrome OS and you will get all your work ready for you in the same state, you left it. Either it be your docs, your movies, your social networking with Orkut, your blogging with Blogger, your feeds via Google reader, your status updates via Google Buzz and so on.. moreover, once XOAuth starts working in that direction then it would also be easy to announce that all these services wont be sharing data (that could be a security concerns). Definitely Google understands that most of the users might prefer working with what comes out of box like they did with Internet Explorer or Outlook Express. But question is, even if you seems to be winning in long run, why not to treat each service separate to make them best on their own? Didn’t Internet Explorer Team working in the same way now? Haven’t people started leaving Internet Explorer at last? Orkut is still the best about functionality, just what needed is more attention and more people to it. At least few of giant applications, games etc. Blogger needs to learn basics from WordPress. Something like WordPress.org needed to hand over the whole code to users. More of it, needs to integrate things in a way that one could get things working out of the box, be it states, widgets or professional looking themes? I find lack of flexible themes from Google itself as a major fault, at least should showcase 50-100 themes in dashboard like WordPress does. Acquisitions; are they pose some issues as well? When you acquire some new company then you mingle with entirely new set of rules that company might be following, a different environment, a different system that might have been crucial for working of the same. Sure, the pieces don’t fit together that easily, but still users expect a lot. Orkut users expect that why not Picasa albums and Orkut Albums could be combined or have some link between them. 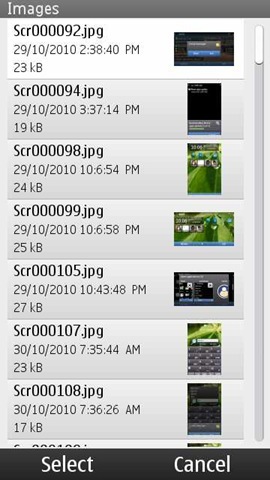 Picasa users expect that why they are under 1 GB limit, when Orkut Albums could enjoys around 10, 000 pics means many GBs. I understand the technical/ administration aspects, know that both of them are different services and acquitted at different times and its never been in Google that you change entire way of working once you take over some company. But users expect as other services from your side already keeping the bar higher. Obviously integrating things asks for compromises as you cant go with downtimes and can’t predict what will be the response, if you come to change something entirely. Obviously acquisitions pose some issues that take a little time to go off and that time might be crucial for an early initiative. Even after writing this much long, I might not be sure that what other reasons might be, same with Google, I guess. My verdict is Social Services are different in the manner that early initiatives, spreading, integration with other services and reach to mass in simplest manner is what keep them going .. sometimes being technically better might not be sufficient. Google needs third party developers a lot. To work over Symbian Apps for their Social Services, to work over engaging applications/ games for Orkut etc. Google Maps is brilliant, Gmail App is cool, but Orkut App is crap in looks as Jad apps might be limited in their functionalities. Needs to come out from the same. 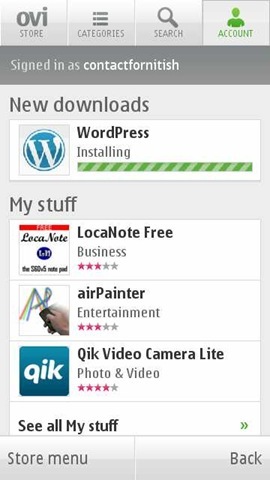 Twitter/ Facebook/ LinkedIn all getting apps for Symbian and others to get people catching up with them. You can’t rule out already popular things, if wanna growth of own things. 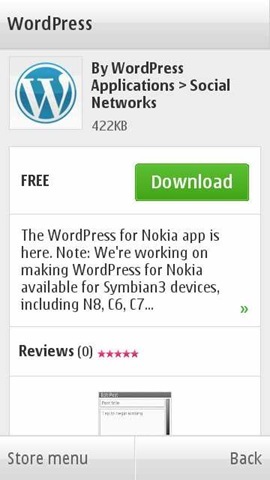 Have to support Symbian Apps. Aren’t Gmail/ Google Maps App been a tremendous success? Being open has made Google a success and that’s what needs to go on. Requesting others to take part in discussion via comments. 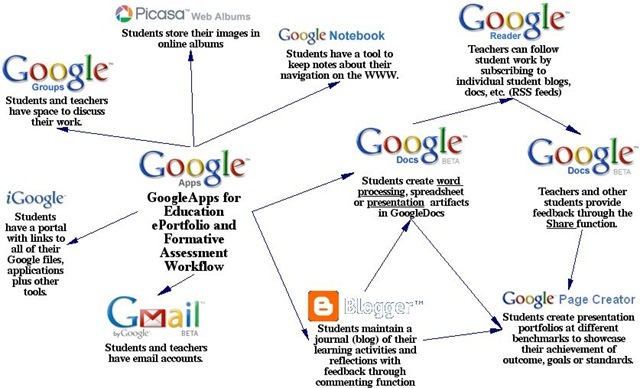 Author Nitish KumarPosted on April 3, 2010 April 22, 2010 Categories Nitish Kumar, TechnologyTags Blogger, Buzz, Cloud, Facebook, Google, Layman's take, Nitish, Orkut, Social Services, WordpressLeave a comment on Whats wrong with Social Services of Google? Sometimes, we write coz we are afraid of our empty selves. Sometimes, we write coz we feel afraid that why we are not feeling like writing. Sometimes, we write coz we just wanted to say something and don’t want to say the same. There might be many reasons, why I am writing this time, there might be many reasons, why one writes or think about writing. Some times back, I wrote an article about writing blog with an obsession that may it inspire few more people to write blogs. May be it was for some, but today I wish to put a little more efforts. First one, who get into writing due to free flow of thoughts and quick enough to sit down and type on before the thoughts may get mixed up in already messed up life’s little big things. Second one, who think about writing first and then plan for the same with related materials, make a draft first, think about its salability, think about it marketability, think about theme around it and think about all other minor details, which right now, I don’t even know. 🙂 But the best part is, in all these things, this second category take just a very little time more than the first category. Obviously, the results are favorable for the second category and the first category sometimes cries that why don’t their authentic thoughts get proper attention than the technical ones. Anyway, I still wish to be termed as one from the first category and even right now wish to write for the first category. Choosing a topic: I know this doesn’t go well with newbies as we want to write but we don’t know what our exact tastes are and at which topics we could attract more people. Note that in start choosing topics might be random, but sooner or later you will be needed to find some central topic for your blog, which will define the theme around your blog, so give a thought about the topic for sure. Choosing a platform and design: This is about choosing platforms, tools, attractive themes and contents. for a professional view, you could check the ProBlogger Article. But at my blog, thoughts and recommendations are my own and so I recommend WordPress, whole heartedly either you are writing over the free WordPress.com domain or setting up your own domain from the software provided by WordPress.org. The reason of recommendation is the level of comfort and available options you could configure, which is also certified by most of the public. After choosing the platform, you need to choose a theme as light as possible, which could loads as fast as possible coz you have only few seconds to impress the person visiting for your link and if most of these seconds will be taken by loading of pages, then you know the answer …. F*** Off. Choosing a name/domain: If you are not planning invest anything in start and just wish to go for it for satisfying your passions of writing, then the second part is irrelevant, but the first part still matters a lot. Choosing the name; It will sure be a crucial step for your blog as its kind of identity, which will be hard to change later on. You need to be specific about naming the blog, so that it could strictly match up with your blog theme today and tomorrow. One more point is about ease of search and easy to market, so that better is if the name contains the central keyword, your blog is going to be all about. A writing tool: Although there are many ways including Microsoft Word, Open Office etc from where you could post articles to your blog without thinking that blogging is something different than making docs in your computer, but when it comes to SEO and marketing things then you come to know that technically how much important it is to have as clean HTML code behind your post as much possible. So, better to use web editor and knowing some basics of HTML as well or if thinking about convenience then Using Windows Live Editor. For me the later option been a joy ride till now, due to availability of so many plugins, about which you could only dream of, if you are on your own with default web editor only. Writing/creating a hundred posts (assuming an average of four posts a week): Although it was not serious thing to me in first sight, but I found it very true, when given some thoughts over it. Sure, habitual and regular writing is what could be foundation of a successful blogging, otherwise, you will come up with a random thought, an article will roar for few days and then you will come to see your own blog after around one month. If even you are not interested and serious about your blog, then who else will be. Be regular, be rich about content and put your efforts as earning first 1000 views is much harder than earning next 1000. Subscribing to big blogs of similar tastes: I will recommend for every blogger to make full use of Google Reader etc to keep a collection of subscriptions and also keep on visiting the same as a daily habit as this provides food for your thoughts. As many things and thoughts you know, as much and as content you could write upon. Registering with digg, stumbleupon, twitter, del.ico.us etc. : It might sound a joke, if someone come up to say that he/ she is not part of all these or don’t even know, but it might be. Why to register with these things? You just want to post some thoughts over web after all not the social networking. But these things are important for giving initial exposure towards your posts. Its better if you are connected to many in these way, so that if you wish to say something, many will be here to take attention. Participating in forums: This requirement is due to the same the reason, PR exercise as I mentioned in earlier para. Moreover, it provides you quick comments and thoughts sometimes. Leaving comments/back links on other blogs: Its like dropping your business card at places and writing names on walls filled with other advertisements, which make your name getting attention. Once, you are seriously in blogging word, you will come to know that how precious these back links are as these back links provide you a share of other’s hard work many times and sometimes, even this little share is too much for a starter. Printing business cards with your blog address/ Telling friends about your blog: Its the basic advertising but it still has worth for everyone. Its like mouth to mouth publicity for your blog and very better if it results in developing a core of followers. Spreading the word on social networks (facebook, etc) is just part of the job. Understanding the trends and search terms about your posts: Its a very necessary part of the game to deploy webmaster tools from Google, Yahoo, Microsoft etc to know that how your posts are being reached. What are the search terms and what are the back links, so that you could work more and more in a systematic way. After all, its your learning curve, which makes you gain something over others. 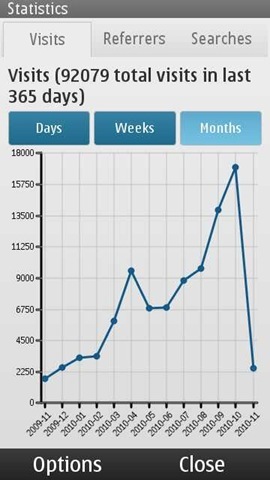 Keep targets about your reach: In early days, take it as a play to know hits over your blog every day. Early targets might be 50 per day, then 100 per day and then 1000 per week and so on. Once, you are involved in this game, you automatically get yourself involved in following the other steps to keep the number of hits steady up. Anyway, leaving from here.. thought to write as was not feeling asleep, so thought to drop in some words about writing. I already wrote in my article about Blogging, that Windows Live Editor was a better option because of one reason that its free. Microsoft sure had adhered user’s requirement that Blogger will require a minimal yet sophisticated platform with the core necessity that it must be free for sure When it was released, I tried it right then and liked its interface and all those things, but one basic thing was missing and that was justification of text (although now I was not sure that it was really not there then or I missed something), but now I am happy to see that its right there and working perfectly as I got the latest build 14.0.8089.726. Really I didn’t thought that someone will be this much seriously asking for not using Word. As earlier I already wrote in my article about Blogging, that Windows Live Editor was a better option because of one reason that its free. Microsoft sure had adhered user’s requirement that Blogger will require a minimal yet sophisticated platform with the core necessity that it must be free for sure 🙂 When it was released, I tried it right then and liked its interface and all those things, but one basic thing was missing and that was justification of text (although now I was not sure that it was really not there then or I missed something), but now I am happy to see that its right there and working perfectly as I got the latest build 14.0.8089.726. The magic didn’t ended here. There was a link for adding plugins. I thought that there was no option for adding plugins to WordPress.com Blog, so this must be something to do with Live Editor itself and after going through, I really got some cool plugins like attach file, Code Snipset, Contact (hCard), Google Maps, I’m Feeling Lucky, IMDB Info, Polaroid Picture and WikiPedia Link. Also, I got to see easy options for embedding videos like from YouTube. I really feel that I should have started using Windows Live Editor sometimes earlier. I know its kind of stupid, but I am not that into Website deployment or could say missed the basics completely. But anyway, all is resolved now. In next, I was to convert all my manual entered links in the same format. I will keep the same thing in my mind for future reference. Please read my article over How to make a Website from WordPress first. My issue was related to relative path and absolute path, which I came to know later on (Sometime just defining the problem in current copy book terms make the problem half solved). All of the URLs of the same site were seemed to hard coded to be consisting of local IP of the same site, which was an issue, if I was planning to put the same over some public IP for being accessed from outside (as currently we are not planning to own some domain name or web hosting service, so only public IP based access was sufficient). In the next step, I am about to put the latest version of the same theme for the run. Have to check first that how many settings its gonna to change and how much manual work it will require after updating. Wish me Good Luck!